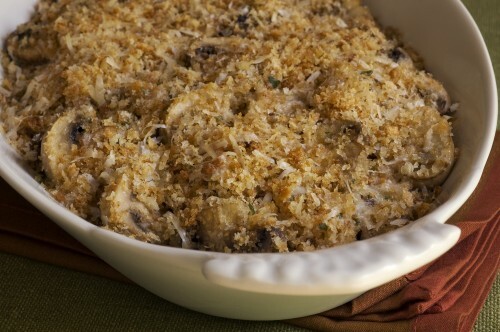 Mushrooms lovers will delight in this delicious, easy side dish. Great with roast turkey, beef or lamb. The Marsala-laced liquid from the mushrooms can be added to gravy for a sensational flavor boost. Preheat oven to 425ºF. Melt 1 tablespoon butter. Combine Marsala cooking wine and soy sauce; stir in butter. Pour mixture over mushrooms in a large bowl. Let stand 10 minutes, stirring frequently. Meanwhile, in a small bowl stir together bread crumbs, cheese and sage. Melt remaining tablespoon butter and stir into bread crumb mixture. Set aside. Pour mushrooms into an 8 or 9-inch pie plate, square baking dish, or similar size shallow baking dish. Bake on upper oven rack 15 minutes. Remove from oven and use a ladle or turkey baster to remove half the juice. (Use the juice for gravy or meat sauce!). Sprinkle mushrooms with breadcrumb mixture and bake 10 minutes more. Kitchen Notes: If recipe is doubled, add about 5 minutes to the baking time. As I’ve mentioned previously, I like the reliable consistent flavor of Holland House cooking wines. That’s why there is no added salt in this recipe. The cooking wine has it all. Yummy…I am definitely going to try this. I love mushrooms! I am a mushroom-lover and this does sound very delightful! Oooh, I’ll be waiting to hear if you liked the recipe! I made this for the holiday dinner. It was very popular, and people asked for the recipe. SO glad folks liked it, Anca! Did you use any of the liquid for a gravy or sauce? And did you use Holland House cooking wine or?? We didn’t use the Holland House cooking wine because I had some other marsala in the house from a previous cooking activity, so I can’t say anything for that. I made gravy from the liquid for the next evening’s meal. Sooo tasty. Thanks for posting. For those of you who don’t use cooking wine, be sure to season the recipe with salt. For my Holland House cooking wine recipes, I purposely omit salt or greatly reduce it, since cooking wines contain salt.